We believe in the philosophy of hard work. Expect to sweat, to work harder than you ever have before, and to take a huge step towards your fitness goals. Our Muay Thai classes combine both traditional Thai-style and Dutch-style training techniques to produce winning fighters. Whether you want to get fit or get in the ring, Sitan's Muay Thai classes can get you into the shape you want to be in. We have three levels of classes that cater to everyone from the total beginners and weekend warriors to competitive fighters. What do I need to bring to a Muay Thai class? We recommend that you bring workout clothes, a change of clothes and a water bottle for your first class. 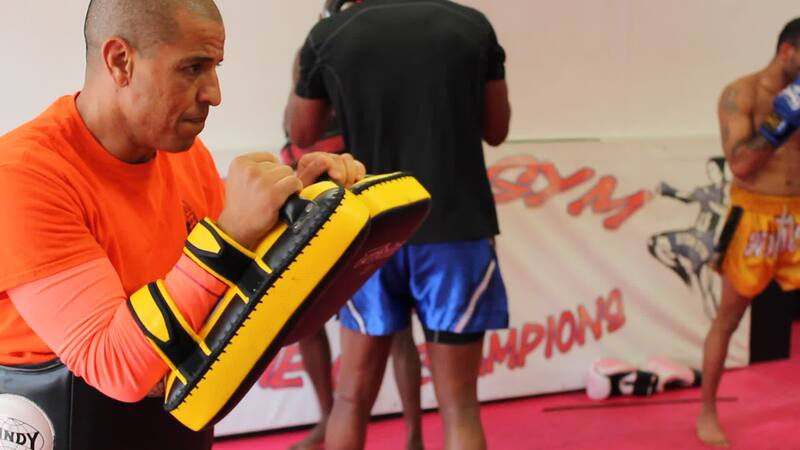 If you know you'll be continuing Muay Thai classes, we recommend that you buy your own pair of boxing gloves, shin guards, Muay Thai shorts and hand wraps. If you're not sure what to get, feel free to ask us for recommendations. What level class should I attend? Our beginner classes focus on conditioning and perfecting the fundamental techniques of Muay Thai. Students typically stay in this class for 2-3 months before moving onto the intermediate level class, where more advanced drills are practiced. Students that have more Muay Thai experience should take the advanced class, where we practice everything from clinching to sparring.